In thinking about the effect of ice melt on sea levels, scientists are especially concerned about two massive glaciers known as ice sheets, one in Greenland and one in Antarctica. The Greenland ice sheet covers .65 million square miles (1.7 million sq. km), and contains .68 million cubic miles (2.85 million cubic km) of ice. The Antarctic ice sheet is many times larger; it covers more than 4.6 million square miles (12 million sq. 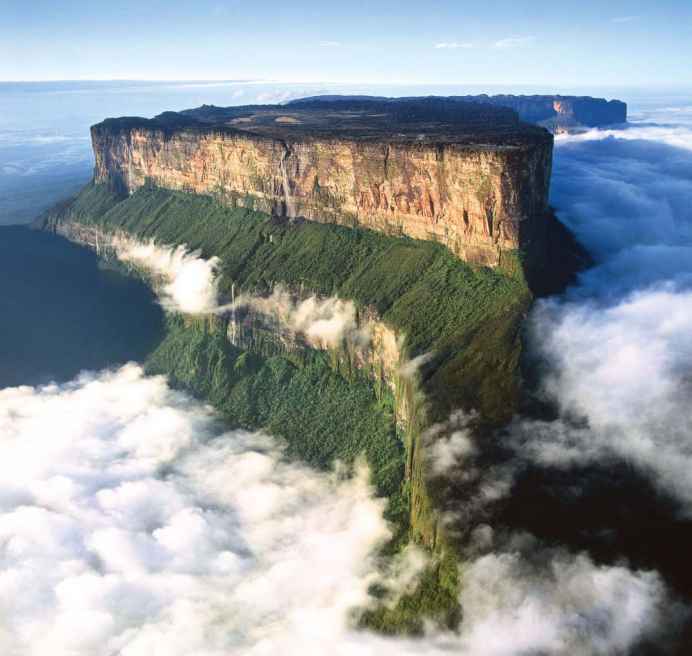 km), and contains more than 6 million cubic miles (25 million cubic km) of ice. Together, these ice sheets contain enough water to raise the level of the ocean by more than 223 feet (68m) according to a Working Group contribution to the 2001 Intergovernmental Panel on Climate Change report.12 The ice sheets, in other words, contain massive amounts of water. If global warming caused them to melt to any significant degree, sea levels could rise significantly. Source: Monica Villavicencio, "Is the Planet's Carbon Sink Getting Too Full?" NPR, August 2, 2007. www.npr.org; Intergovernmental Panel on Climate Change Report, Climate Change 2007: The Physical Science Basis. 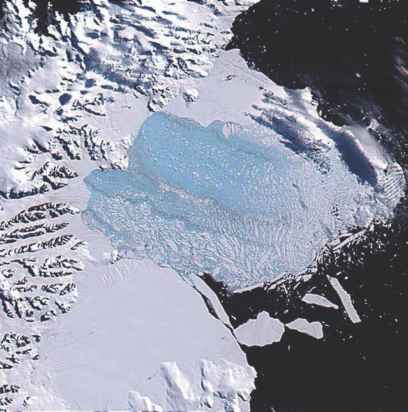 As one example of such a "trick," Archer points to the sudden break up, or as it is called, the explosion of the Larsen B ice shelf in the Antarctic Peninsula in 2002. An ice shelf is a thick, floating platform of ice that forms at the edge of a glacier. The 2002 explosion changed "a continuous region of ice the size of New Hampshire into a blue slurpy mash of tiny icebergs in just a few days. "14 Scientists believe this sudden explosion may be related to an increase in ponds of meltwater forming at the surface of the ice. Such ponds have also been observed on the surface of other ice shelves, and scientists are concerned that similar explosions may occur in the future. Ice shelves are already floating on water, so their breakup does not directly affect sea levels. The disappearance of the ice shelf does seem to increase the rate of seawater melt from adjacent land-based ice, however. Dramatic events such as ice-shelf explosions also emphasize the way in which feedback events can cause significant and unpredictable melting. Scientists worry about several possible feedback effects that may cause the ice sheets to melt more quickly than anticipated. The first is the albedo effect, mentioned in the previous chapter and above in the discussion of sea ice melt. Again, if sea ice melts, it does not raise sea levels. But it will lower albedo, as water reflects far less light than ice does. This effect is of particular concern in the waters around Greenland, where there are significant amounts of floating ice. As that sea ice melts, the region will warm, and the Greenland ice sheet may also melt. Another feedback mechanism that worries some scientists also involves melting ice. "As an ice sheet's surface begins to melt, some of the water filters down through cracks in the glacier, lubricating the surface between the glacier and the rock beneath it. This accelerates the glacial flow and the calving [breaking away] of icebergs into the surrounding ocean," according to environmentalist and founder of the Earth Policy Institute Lester R. Brown.15 Brown also argues that such water, as it flows into the glacier, carries heat to lower parts of the glacier faster than might be expected. The 2002 fragmentation of Antarctica's vast Larsen B ice shelf (the pale blue area) may speed the thawing of land-based ice, which could raise sea levels. AP Images. The melting of ice sheets, in other words, does contribute to sea-level rise. For the moment, scientists such as van de Wal believe that its contribution seems modest, though important over time. The systems and mechanisms involved in ice sheet melt are sufficiently complicated, however, that unpredictable dramatic events or changes remain possible.